It’s easy to get someone to want your sample (or in the case of SaaS companies, your freemium plan or free trial) when there’s no risk or loss, but getting someone to commit with a monthly price tag is a whole new ball game. Moving free users into paid service plans has long been a pain point for SaaS companies and businessmen alike. On average, only about 15-20% of free users end up upgrading to paid plans (though best in class can see more than 60%) and with the increasing popularity and availability of cost-free alternatives, this task has become even more daunting. To help make the process a little less stressful (and a lot more rewarding) for everyone involved, here are five ways to help convert your loyal freemium and SaaS trial users into happy paying customers. “For a limited time only,” “30-day trial,” “Try it for 14 days;” we’ve all seen or heard these conditions before. They not only grab the attention of your audience with the promise of a free experience, but they also pique their interest with their exclusive and urgent tone. A more subtle way of easing customers into a paid plan is by offering a premium or special promotion for doing so. Sweetening the deal with an added bonus incentivizes the act of upgrading to a paid plan for your user, therein by making it more appealing. Doing this makes your audience feel like they’re getting more value for their dollar and fear of loss urges them to act quickly as this premium may not be available at another time. 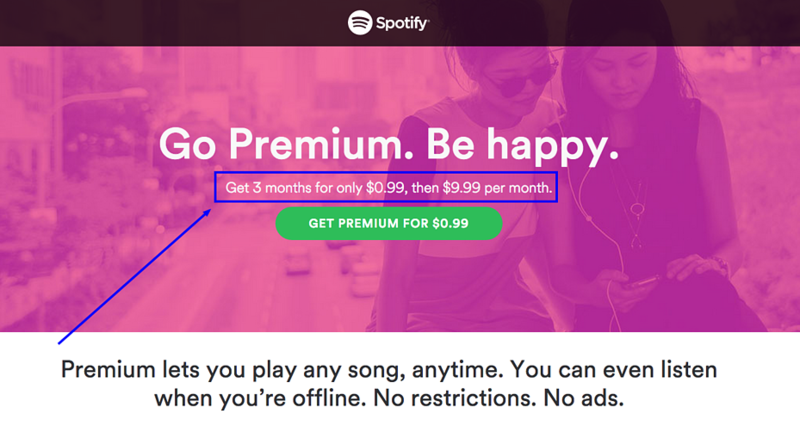 Spotify does a great job of executing this by offering new premium users a 90% discount on their first 3 months of service. What Can You Do? Offer users a time-sensitive discount or free gift for signing up for one of your paid plans. As the end of their trial approaches (or when they’ve been using your free plan for at least a month), email them the offer with a deadline. Perhaps it is a discount on their first few months of service (like Spotify) or a free copy of your CEO’s latest book; whatever it is, make sure that it is substantial enough to sway a customer, but not extravagant enough to detract from your ROI. Here’s a little life advice: whether your audience is your mother, your best friend, or in this case, a prospective customer, you never want to catch a person off guard when asking for money. In the end, you want to get your trial users engaged with your product as soon as possible. In order to make an impact, your SaaS needs to either become a need or become a daily habit in your trial users' life and the longer they wait to get started, the less likely this will happen. That’s why your follow-up series of trial emails is crucial. From a sales perspective, think of this period as a deadline to get your leads familiar with your service and to impress them with its capability and the user experience. Once that foundation is laid, you can start delivering content that tells your trial users why they need to become a paying customer such as case studies, reviews, or discounts. When people first arrive on your homepage, pricing page, or landing page, they should know exactly what they’re getting into. This all comes down to your value proposition and messaging. To avoid confusion about what you are offering, make sure your value proposition is as direct and clear as possible. Pricing “surprises” based on poor messaging can only fuel a user’s argument against paying for your service, so eliminate all ambiguous or misleading language and paint a realistic picture of what the user can expect in terms of your product and cost. For example, if your free plan or trial is only for a limited amount of time, make that overtly known in your copy like Litmus does on its pricing page. If you want your product to speak for itself before talking price, take a page out of SumoMe’s playbook. While the company did have a free plan, by including “free” in the value proposition on its homepage, it was, in many ways, setting the expectation that it would never ask users for money. With an idea like this planted (and so prominently displayed), it can be difficult to convince free users to upgrade to a paid plan. In fact, any effort to do so could even be seen as an unattractive “bait and switch” sales tactic. In a future homepage incarnation, the SumoMe team removed “free” from its value proposition and instead urged people to “Try it Now” in its call-to-action. With this subtle, yet powerful change, the company brings its audience’s initial focus back to the value of the offering, rather than its price. There was no question as to what SumoMe was bringing to the table and this message stayed with you as you scrolled down the page. By using the word “try” in its call-to-action, the company also made it clear that the audience can only get a small taste of what the product can do for free. Unlike the previous copy, this iteration is more casual, less binding, and sets the stage for future engagements. It should come as no surprise that some people may be a little disgruntled when they are being prompted to pay for something they once enjoyed for free. With this in mind, you should aim to remove as much additional friction as possible to help make the move a more pleasant experience. If moving from free to paid requires a lot of work on the part of the trial user, you are just giving them one more reason to object doing so, so make sure to take as much stress off of their plates as you can. What Can You Do? Put yourself in your buyer persona’s shoes and ask yourself what kind of inconveniences would deter you from signing on to a paid service or plan. Bad customer service? Hidden fees? An invalid form of payment? Go through your process with a fine-tooth comb and determine what small barriers could be standing in the way of free trial users upgrading. Once these have been identified, work with your team to eliminate them or find a way to facilitate the process.